A Ukraine International Airlines flight from Lviv to Sharm El Sheikh on July 30 made an emergency landing at Boryspil International Airport because birds were sucked into the plane's engines, Lviv City Council deputy Ihor Zinkevych has said on his Facebook page. "At 21.00 the flight PS5265 Lviv - Sharm-el-Sheikh made an emergency landing in Boryspil after the birds were sucked into the engine. It is not known when the next plane will come from Kyiv," he said. UIA's press service told Interfax-Ukraine that all passengers of the affected flight were served at the airport (dinner), put on a different plane and flown to their destination. 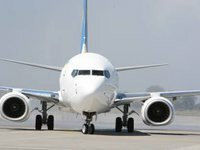 "To ensure the safety of passengers on board, the commander of the aircraft decided to make an unscheduled landing at the Boryspil airport," UIA said, adding that a ground check of the Boeing 737-900 aircraft after landing did not reveal any serious damage.